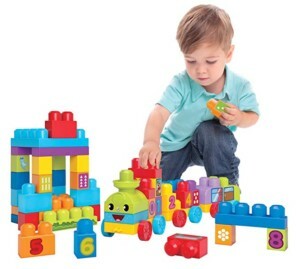 For little engineers, wonder and imagination are simple and essential elements of everyday play. 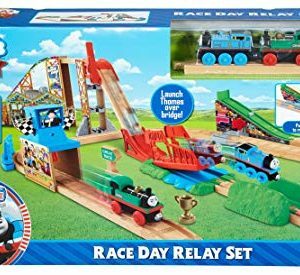 Inspired by the DVD, The Great Race, the Race Day Relay playset helps encourage their curiosity and inspire their creativity by helping relive the adventure from the DVD as well as create their own stories along the way. 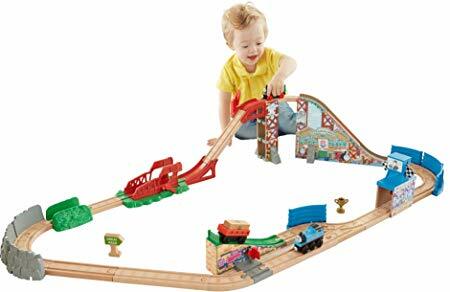 With Thomas & Friends Wooden Railway Race Day Relay, children can roll Thomas up the track, through the start gate, and – with help from his friend Gina – push the cargo past the finish line and win the trophy! This full-filled playset has colorful artwork featuring another one of Thomas’ friends, Ashima! 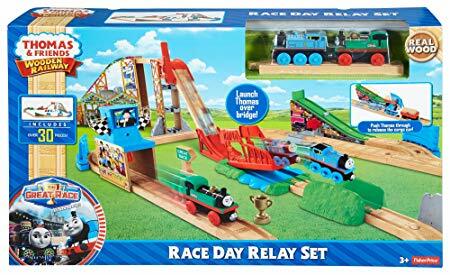 The Race Day Relay playset presents endless fun in a beautifully simple way, because after all, it’s the simple things that are the most treasured, and like our playsets, the memories you and your children create will last a long time. On Your Track, Get Set, Go! Thomas and Gina are all set for the Race Day Relay! Place Thomas at the top of the hill behind the lowered start gate. 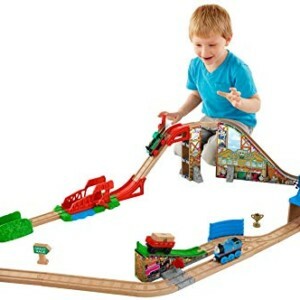 Once children are ready to start, they can lift the gate and watch Thomas WHOOSH down the hill and launch off the bridge. 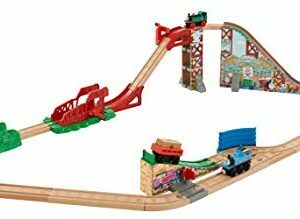 The bridge features a lever that children can use to either lift the bridge to watch Thomas “fly” or they can lower the bridge so it acts as a natural part of the track. 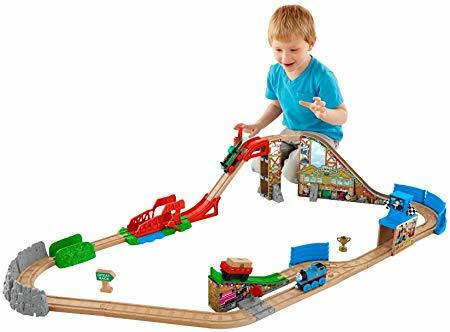 Once Thomas makes it to the cargo portion of the relay, little engineers can push him through the shunting gate to automatically release the cargo car and wooden cargo. It’s the home stretch now! 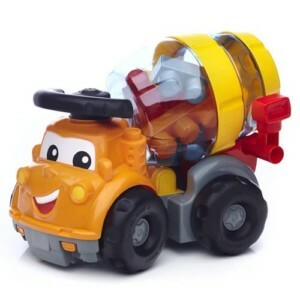 Push Thomas and the cargo car through the finish line and watch as the checkered flags pop out to let children know they’ve won the race. To add to the fun, place the coveted trophy on Thomas’ funnel to celebrate the successful victory! 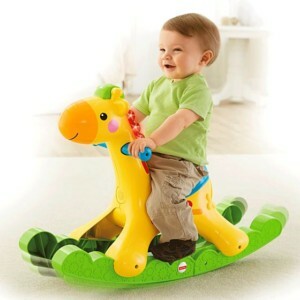 When the race is done, children can easily reset the playset and start all over again! Even though Thomas and Gina are racing towards the finish line, they are doing it as a team. 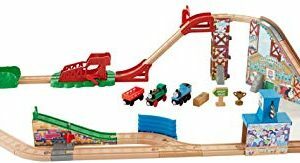 Thomas & Friends Wooden Railway Race Day Relay offers a friendly take on competition; teaching kids that friendship and teamwork win the race. 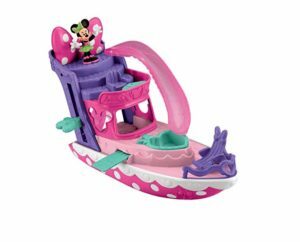 Our playset also presents a variety of new sights, colors, and textures that may encourage physical and cognitive growth and development. This additional location to Thomas’ world provides a whole new experience of visual, auditory and tactile stimulation. 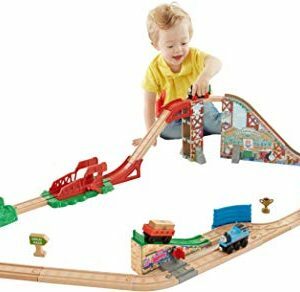 Lifting the start gate along with raising and lowering the bridge may help enhance your children’s fine motor skills and foster their understanding of how things work and what mechanisms cause exciting actions.